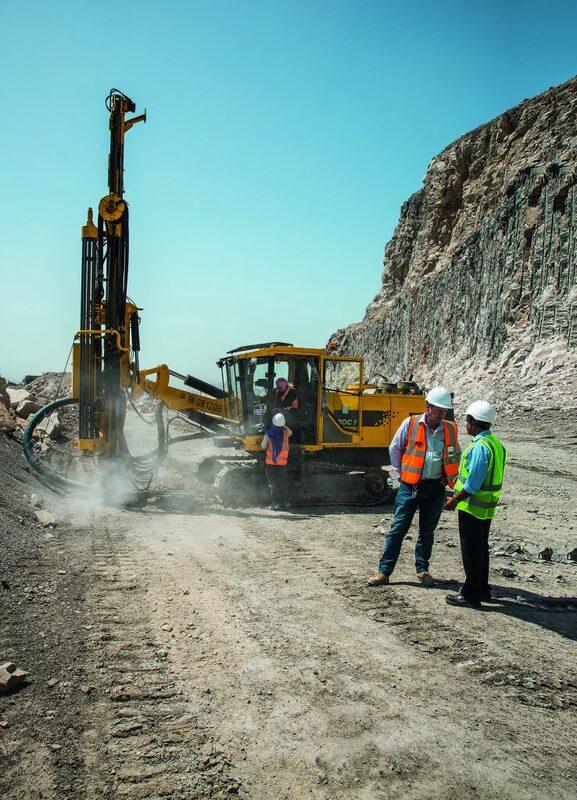 In 1997, Atlas Copco delivered its first drill rig to Ras Al Khaimah Rock Company (RAK Rock) in the United Arab Emirates. 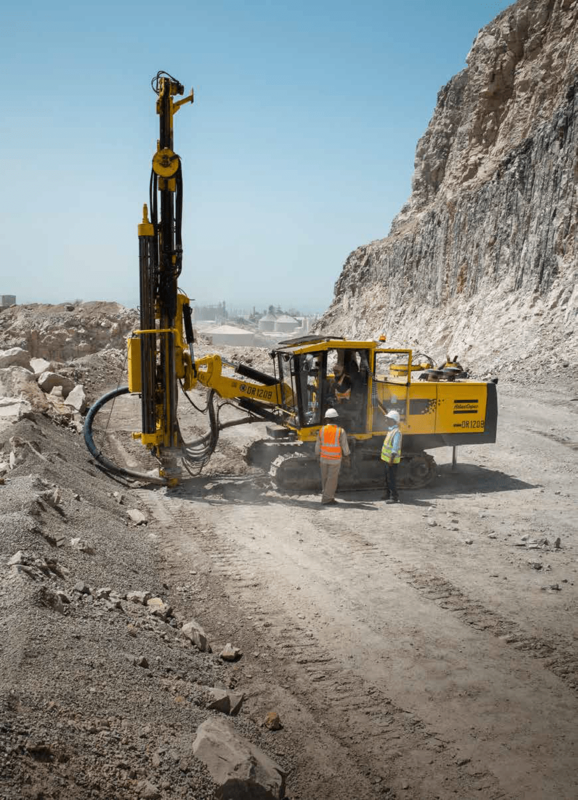 Since then, the two companies have had a close relationship, while RAK Rock has developed into one of the area’s major suppliers of limestone. Today, seven drill rigs supply more than 22 million metric tons of limestone per year to cement plants across the Gulf region, particularly to Kuwait and Bahrain. One of the drill rigs, however, was losing pace. The 15 year old ROC F7, with a low availability rate of 55–60 percent, was not performing to its expected capacity and was not meeting production demands. With the downturn in the market, it was not viable for RAK Rock to invest in a new machine to improve reliability and performance. ATLAS COPCO PRESENTED the Midlife services program as the best alternative for RAK Rock. It was the best option in the present market conditions, rather than investing in a new machine, and also more economical than a major re-building of the rig. Still, a midlife rebuild could mean several years of added life to an old machine. “For a couple of months we had discussions on pricing, since it is still a big investment for the customer and Midlife services was a new thing for the RAK Rock management. But after so many years of working together, they were always confident in us and we were confident that we would be able to make a deal. Eventually, we settled on a price,” says Vasanthalu Shivakumar. THE SERVICE CONSISTS of engineers and technicians from Atlas Copco going through the machine thoroughly, replacing vital parts. In this case, feed beam components and the electrical harness were the major components that needed an upgrade. THE AVAILABILITY of spare parts was a challenge, as this particular machine model has been out of production for several years. Thanks to good communication with the Distribution Center and parts planning in Sweden, as well as contacts with sub-suppliers, the parts were eventually found – and within the agreed time frame. An agreement was made that when the majority of the spare parts had arrived in the UAE, the Atlas Copco crew would start working to save time, and the machine was being stripped. IN JUST EIGHT WEEKS, the Atlas Copco workshop completed the job. When the ROC F7 was running again, the drill rig’s availability increased from 55–60 percent to 95 percent with improved performance, reliability and operational efficiency. The operation turned out so well that RAK Rock has already confirmed an order to perform a midlife rebuild on a second ROC F7 rig, and on completion Vasanthalu Shivakumar is expecting to carry out midlife rebuilds on a ROC F9 rig as well. “I have been working with the Customer Center for 12 years now and I have been part of a number of midlife rebuilds. The outcome is always good,” he says. JEFF RIDLEY, Quarry Superintendent at RAK Rock, says: “We could not be happier with the results. We are now reaping the benefits of the much improved drilling accuracy from this machine, with operators now able to collar the machine better and drill straighter holes. This is helping us to realize down the line operational costs savings through improved blast performance.